The cooling medium of a machine tool shall be utlilized for two separate purposes: (a) cooling of the tool and (b) controlling the temperature within the shear zone. The cooling channel consists of a number of interconnected drillings, fitted with a nozzle at the outlet. For a successful CFD simulation, the channel was discretized with 3.183.157 finite elements (a small section of the channel is shown below). Streamlines for the flow of cooling medium through the tool channels. Several nozzle geometries were studied (one of them is shown to the right). They were discretized with tetrahedral elements and a so called expansion layer of thin prismatic elements near the boundary. 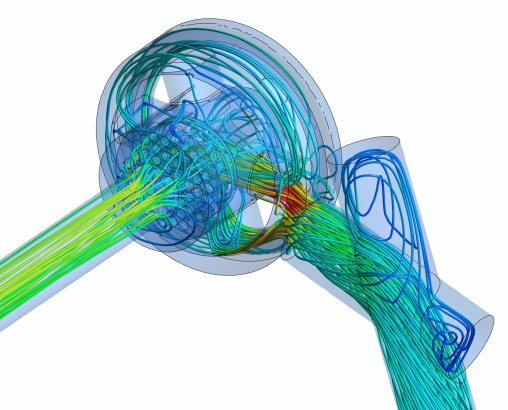 The results of the simulation show the reasonable operating conditions of the jet break system.. 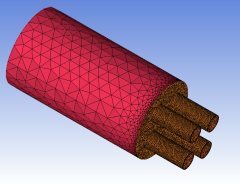 They also help to choose the optimal nozzle geometry. The project was carried out for Millturn GmbH.